Our fully equipped sheet metal shop can handle your industrial sheet metal needs. 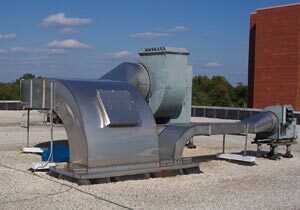 We are truly diversified and can design, fabricate and install items from belt guards to roof dormers to even complete industrial exhaust systems including fans, piping and collectors. Complete, trailer mounted dual burner gas grill cookers can also be fabricated and assembled in our own shop. We have the flexibility to work with our clients on weekend work and during shut-downs. We are confident that we have the personnel and equipment to meet your sheet metal requirements.